The pace of credit disbursement has accelerated in the current fiscal year, with banks extending Rs1.7 in loan for every rupee of deposit collected in the first quarter. This has raised the spectre of the country facing shortage of funds that could be immediately extended as loans as in the last fiscal year. Many banks faced a severe shortage of loanable funds in the last fiscal year because of mismatch in deposit collection and credit disbursement. 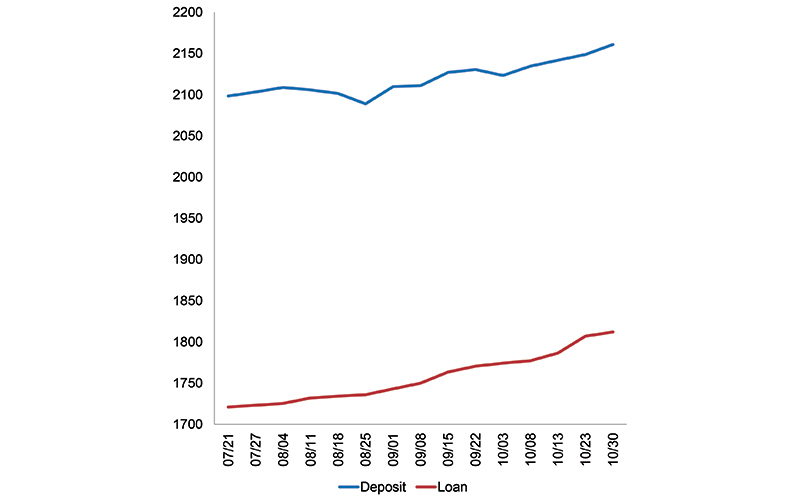 Banks, at that time, faced slowdown in deposit collection due to deceleration in remittance inflow and slow public capital spending, while demand for credit continued going up. This had put some of the banks in a tight spot, prompting them to flout the regulatory lending limit. Nepal’s banking sector may face similar situation this year, as commercial banks have once again ramped up lending. Commercial banks issued around Rs91 billion in fresh loans so far this fiscal year, but collected around Rs63 billion in deposits in the same period, according to the latest report of the Nepal Bankers’ Association (NBA), the umbrella body of commercial banks. The report captures data from July 21 to October 30. “Banks are disbursing loans at a faster pace because of hike in capital base,” Bank of Kathmandu CEO Shovan Dev Pant said. Commercial banks have raised their paid-up capital by four-fold to Rs8 billion as per the regulator’s instruction. Banks are allowed to lend 80 percent of their total local currency deposit and core capital combined. The stock of local currency deposit of 28 commercial banks in operation stood at Rs2,054 billion as of October 30, show the NBA data. These banks maintained core capital of an estimated Rs310 billion during that period. This means banks held Rs2,364 billion in local currency deposit and core capital. Banks can lend 80 percent of this amount or Rs1,891 billion. As of October 30, banks had extended Rs1,785 billion in loans in local currency. This shows banks have around Rs100 billion that could be immediately extended as loans. This stock is adequate for more than three months considering the pace at which credit was disbursed in the first three months of the current fiscal year. Remittance inflow went up by mere 0.7 percent to Rs115.6 billion in the first two months of the current fiscal year, according to the latest Macroeconomic Report of the Nepal Rastra Bank. If inflation is adjusted, it could be said the country’s remittance income fell in real terms in the two-month period. On the other hand, the government’s capital spending stood at meagre 5.2 percent of the allocated budget of Rs335.2 billion as of Wednesday, or after more than three months into the current fiscal year. These indicators are not good for banks, as remittance income and capital spending are two major sources of deposit for commercial banks.